Thomas Stone High School has flipped over positive relationships in the past four years. Four years ago, several staff at Thomas Stone were trained in Capturing Kids’ Hearts, a program designed by Flip Flippen of Texas. The basis of the program revolves around showing students trust and respect and helping teens become leaders. At Stone, teachers have embraced a philosophy from the Flippen group that students need at least seven positive touches a day. Students at Stone get this when teachers stand outside classrooms and greet each student with a handshake. “If you get each student at the door with a handshake, you get immediate understanding,” said Thomas Stone Principal L.C. Martin. Martin said he discovered the program during a workshop and encouraged faculty members to participate in it. Martin said over the years the entire school has latched on to the philosophies of Capturing Kids’ Hearts. He said data indicate that the program has had a positive impact on the school. For example, suspension rates dropped 30 percent from 2006 to 2007, student attendance increased 1.2 percent in the same year and staff absences have decreased by 35 percent from September 2008 to January this year. Flippen, who was in town for business, stopped into Stone last week to meet students and staff and see how the program has helped. Flippen said he spends most of his time visiting cities and giving speeches about his program. Visiting Stone was a treat for Flippen, he said. “I never get to do this, I love this,” he said. Martin walked Flippen and Flippen Group consultant Travis Goodwin around to several classes including two leadership classes that the Flippen Group designed. 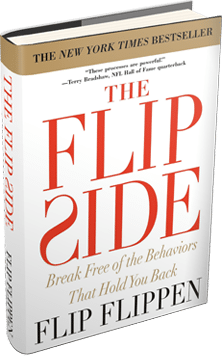 The Flippen group also works with corporate organizations to help build positive successful relationships in the workplace. Flippen told students that he graduated towards the bottom of his class and worked hard to get where he is today. He said now he has a loving family of 20 children, many of whom were adopted from other countries. Teachers seemed to like having Flippen visit last week, as many stopped to shake his hand or give him a hug.